The overall digital games market was up 11% year-over-year, earning $6.0 billion in May. Big winner was Overwatch earning.. Valuing the total eSports revenue at$892.8M in 2016E, year-over-year revenue growth is largely a result of more brands and advertisers..
SuperData Research, the leading provider of marketing intelligence for the playable media and digital games industry, has revised its..
New York, NY April 7 – Slots have emerged for the first time as the dominant game across all platforms..
Back in the early 2000s, life was simple. Small design studios in Western markets self-published through their website and..
Research firms team up in response to customer demand, starting with Europe. Virtual reality is now a reality. With the major devices like Oculus Rift, Samsung Gear VR, and HTC Vive..
SuperData is the leading provider of market intelligence on digital video..
REPORT: Mobile to drive consumer adoption of virtual reality gaming; 39M installs by year-end. SuperData and Ukie sign agreement to provide.. 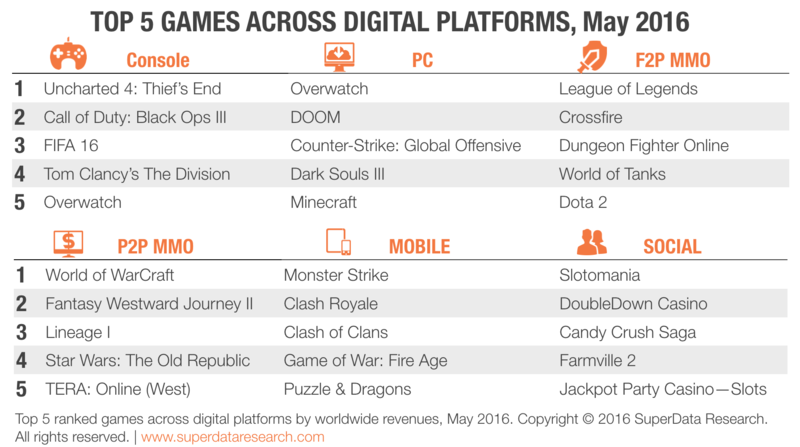 The overall digital games market was up 11% year-over-year, earning $6.0 billion in May. Big winner was Overwatch earning $269 million in digital revenues across both PC and console, pushing the PC category up 8%. Subscription-based gaming on PC took a big hit in May, dropping below $200 million in total monthly earnings. Conforming to seasonal spending patterns, in combination with several strong releases on PC and console, mobile gaming revenue has been in decline three months in a row, after reaching a high of almost $3 billion in monthly sales in February. Mobile gaming revenue in May was $2.6 billion, still up 9% from the same month last year. Blizzard’s Overwatch dominates rankings leaving Battleborn in the dust. Newcomer this month Overwatch (NASDAQ: ATVI) tops May’s revenue rankings with $269 million in earnings across PC and console. The new shooter game is proving to be a hit among online spectators and is currently the 5th most commonly streamed title across live streaming channels. Despite not being free-to-play, Overwatch is rolling out a long-term monetization strategy by offering a hefty quantity of vanity items, including skins and graffiti tags. Take-Two’s Battleborn (NASDAQ: TTWO) had a significantly poorer performance, earning an estimated $18 million. Online multiplayer gaming now a key element in console strategy. Last week at E3 we saw a spectacular lineup from Sony at E3 last week that featured several key titles with online game play. Microsoft doubled down on improving its Xbox Live infrastructure and social layer, and released details on its upcoming pirate-themed title, Sea of Thieves, which is the latest console game to heavily incorporate online multi-player elements. The platform holders have started to notice that additional content sales and a high-spending user base make for a lucrative combo, with games like Smite earning roughly the same on both console and PC, and titles like Destiny and The Division requiring users to be online at all times. For 2016 the market for online multi-player gaming is on track to reach $17.4 billion in revenues, in part driven by console now offering cross-platform game play. Tencent cannonballs into the global mobile market by acquiring Supercell. Until now, Tencent’s mobile operations have largely been limited to China, but this week’s $8.6 billion acquisition of Softbank’s majority stake in Supercell is about to change that. Supercell’s titles consistently dominate mobile revenue rankings: Clash Royale and Clash of Clans earned a combined $193 million the past month, ranking 2nd and 3rd respectively. While Tencent already has international clout through its majority stake in League of Legends publisher Riot, the company is positioning itself as the dominant publisher in the $32.8 billion mobile market. Early signs of declining growth in the mobile games market is pushing the industry toward consolidation. Facebook goes after $4.3B gaming video content market to compete with Amazon and Google. Having signed an agreement with Activision Blizzard that will allow players to log into Battlenet using their Facebook accounts and directly stream gameplay to its main canvas, Facebook has entered the market for streaming video. Starting with Overwatch, Facebook is poised to play an important role in connecting users with content. Despite being a latecomer, Facebook thinks its network infrastructure and massive user base is enough to close the gap with established streaming platforms Twitch and Youtube Gaming. Facebook’s entry into the space may serve as a catalyst for competitive gaming, which is a major content category across live streaming channels, and on track to earn $892 million this year. SuperData Research provides market intelligence on the online, digital and mobile games industry.